The only trampette for junior, senior and elite gymnasts! The Dorado trampoline has been developed without compromise and with a focus on design and effectiveness. This is a trampoline that is very stable and stands solidly even under the heaviest loads. Furthermore, it is silent and provides an extremely good and gentle rebound. The basis for the Dorado has been to achieve the most optimal mini trampoline for senior gymnasts. But by using the adjustable legs, junior and beginner gymnasts can likewise feel the effect of the springs and stiffened frame. Therefore, the Dorado is suitable for gymnasts at many levels and would be a good investment for the club or school. The easy adjustment of the height using the included adjustable legs, the fantastic rebound properties as well as the silent action makes the Dorado a unique piece of equipment. The trampoline is complete with integral wheels, strong frame pads on all sides and non-slip feet. The bed is a high-performance "2-string" type bed. 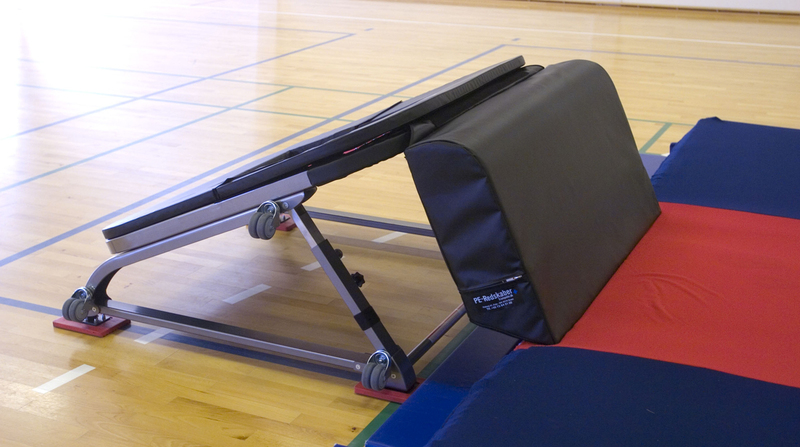 The frame pads supplied with the trampette are full pads, but as some TeamGym gymnasts prefer the response of the trampoline without pads, the bottom section of the frame pads are removable. The Dorado bumper is available as an optional extra for additional safety when using the Dorado - please order separately. The Dorado is the only trampette of its kind on the market!